The co-creator of the hit animated show The Simpsons has died aged 59. 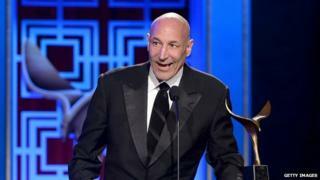 Sam Simon had been battling colon cancer, his agent said on Monday. Simon won seven Emmy awards for his work as a writer, director and executive producer for the longest-running sitcom on American television. The Simpsons, which chronicles the life of a clumsy father and his dysfunctional family, first aired in 1989. Simon led the show's writing staff and is credited with developing the characters that feature in the show. He left the show after four seasons, but continued to receive between $20m (£13.2m) and $30m (£19.9m) each year after striking a deal that gave him a part of the show's future earnings. After his diagnosis, he said he wanted to donate all of his fortune to charity. Simon gave much of his money to social causes, especially those working on animal welfare issues. In 2002 he founded the non-profit Sam Simon Foundation, which is devoted to rescuing dogs from shelters and training them to assist the disabled. "I have a desire to help animals," Simon said in an interview with Reuters in 2014. "It's my money and I get to do what I want with it. It's an expensive hobby I picked up at the end of my life." "It is with much sadness that we must let you know that Sam Simon has passed over," the organisation announced on its Facebook page. Fellow Simpsons producer Al Jean tweeted "a great man; I owe him everything" from his verified account in response to the news. Simon also worked as a writer for a number of hit sitcoms, including Taxi and Cheers.